A growing movement has emerged for holistic and integrated approaches to sustainable development. In efforts to guide humanity to live in harmony with nature, and to restore the health and integrity of the Earth’s ecosystem, the Foundation has taken deliberate measures to support socio-ecological production landscapes which include the formulation of the GC program. It is a certification system that trains, supports, and certifies producers who practice environmentally friendly agriculture that promotes ecological balance and biodiversity conservation. The primary focus of the program is to preserve priority species and restore their natural habitats through technical aid to farmers who are transitioning from conventional to organic agriculture. The approach is to protect the habitats on which species at risk (i.e., endemic, rare, indicator, and endangered) depend on for their survival while encouraging environmentally friendly land management practices. Through sustainable use of natural resources and by taking natural habitats into account when planning land use, conservation status can also apply to terrestrial, freshwater, or diverse habitats that are either particularly important or valuable to the region in question. Figure 1. Green Conservation certification seal in Chinese on the left and in English on the right. For the initiative, transitioning farmers receive training workshops, technical assistance, networking resources, and ongoing consultations to learn the skills necessary to sustain small-scale agricultural operations that are organic or environmentally friendly. In the GC system, facilitators conduct training at community level with a group of farmers to improve their skills and practical experience. Farmers also help each other by exchanging valuable knowledge and experiences. Through education and local capacity-building workshops, small farmers become proficient in the principles of growing a healthy crop, applying suitable integrated pest management techniques, from land preparation to harvest, seed preparation, composting, preparing insect zoos, documentation, and other necessary information. Figure 2. Green Conservation facilitators conducting training in sustainable agriculture for local farmers. Biodiversity conservation has always been an important focus of the GC program, and this emphasis is reflected in the sustainability standards regarding environmental protection. In addition to promoting conservation through the standards, program facilitators provide training on biodiversity-related topics for farmers who are preparing for certification or have already achieved certification. For instance, training curricula address the identification and protection of natural ecosystems, sensitization to the value of wildlife, protection of water bodies, and best practices for managing crops to deliver multiple benefits for farm productivity and conservation. Practices that comply with environmental principles include agricultural activities that have no negative effect on wildlife shelters, species at risk, and natural vegetation. Farmers learn how to identify and prepare inventories of natural ecosystems, and protect and restore them through a conservation program. 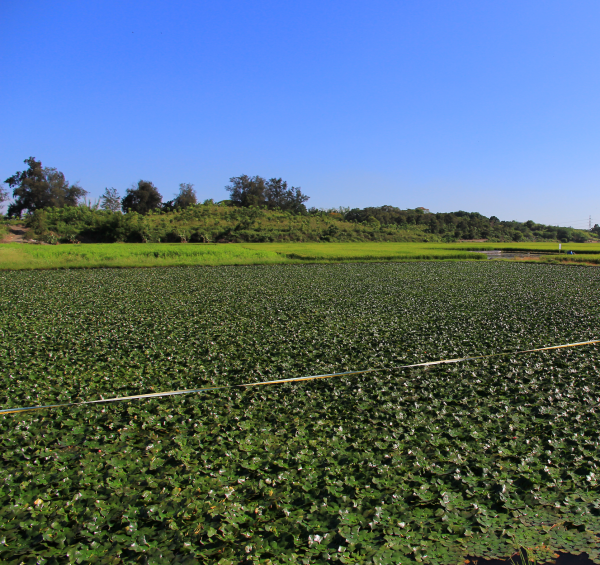 Guantian is a rural agricultural district in southern Taiwan well known for its Chinese water chestnut (Eleocharis dulcis), which is cultivated for its edible tubers. Farmers widely cultivate Chinese water chestnut and other edible aquatic plants in fields which support many resident and migratory birds, especially the rare pheasant-tailed jacana. It is the largest species in the jacana family with dark plumage, contrasting white wing tips, and yellow neckband. They depend on flooded pastures, rice fields, lowland ponds, and marshes with floating aquatic vegetation for survival. The pheasant-tailed jacana was previously common in wetlands throughout the country where they feed, nest, and raise their young. Many species of birds and mammals rely on wetlands for food, water, and shelter, especially during migration and breeding. However, the negative environmental effects of traditional farming have caused dramatic loss of natural habitats and ongoing decline of bird populations. By 2009, habitat destruction and degradation, disturbance of breeding areas, and poisoning from pesticides threatened the survival of many native bird species, particularly jacanas. In response to the crisis, the Foundation initiated the GC program to help support key activities such as: educating farmers on sustainability; conducting ground-level studies of the pheasant-tailed jacana; holding meetings with local officials; promoting bird-friendly agricultural practices to help protect local birds that suffered drastic population decline. Figure 3. Farmers collecting Chinese water chestnuts at a wetland in Tainan City’s Guantian district. Figure 4. The pheasant-tailed jacana defending its nest built on floating vegetation and young chicks feeding accompanied by their parent. As small-scale local farmers apply an array of best practices for environmental and agronomic management on certified farms, it addressed many sustainability issues in production. Depletion or contamination of natural water bodies is a challenge in some regions. By maintaining protective buffer strips along water bodies, monitoring river water quality, and prohibiting the application of agrochemicals near water bodies, farmers protected water quality. To attain high productivity and crop quality, producers must adequately manage crop and soil fertility. Poor soil management and lack erosion control can also lead to land degradation, which may reduce the yield potential of farm plots in the long term. Certified farm operations took steps to address low productivity and soil degradation by implementing erosion control measures, instituting a soil and crop fertilization program, and ensuring that small-scale local farmers received appropriate training and education in good practices. Farming displaces wildlife and exacerbates human-wildlife conflict when the crop is often grown in monocultures that are not suitable habitat for most wildlife species. Where farms displace wildlife or occupy their natural movement routes, there is an elevated risk of human-wildlife conflict, as has occurred between birds and humans in Guantian, for example. Farmers who developed ways to adapt to their surrounding natural environment by carefully utilizing and reshaping it for production activities based on ecological practices successfully protected natural ecosystems and habitat connectivity. Small-scale farmers who integrated sustainable use of land in accordance with the GC standard found crop quality increased significantly as a benefit from conserving biodiversity for a multitude of species adapted to or dependent on the environment where local agricultural practice continues. Figure 5. Sustainable farms in Guantian cultivate water caltrops and rice as major agricultural crops. Data reveal the significance of restored natural ecosystem for protecting rare species and providing habitats for a diverse array of plants and animals. Strategically focusing efforts on these species also helped conserve the many other species which share their habitats and or are vulnerable to the same threats. Conservation-friendly practices have increased the quantity and quality of natural habitats in agricultural landscapes, and helped sustain populations of native species. GC certified farms play an important role in biodiversity conservation, as native species on certified farms demonstrated high levels of survivorship. For example, a study on jacana population in Guantian found the abundance of jacanas increased on GC fields from 275 in 2009 to approximately 1,272 by 2016. Surveys showed the death of birds was mainly due to local farmers’ overuse of synthetic fertilizers and agrochemicals in agricultural areas that jacanas depend upon for nesting and feeding. The number and area of certified farms have also grown steadily over the years. Total land under certified crops increased several-fold, with 3 hectares of production area compared to nearly 40 hectares from 2011 to 2016. GC producers also grew from 7 to 25 during this period. TOAF helped farmers preserve Guantian district’s natural wetlands and convert agricultural land to socio-ecological production landscapes to stop pollution and prevent further destruction of wildlife. Figure 6. Restored natural ecosystems protect species at risks and provide habitats for diverse plants and animals. Figure 7. The farms in Guantian district are an example of socio-ecological production landscapes. This case study explored a system for maintaining, rebuilding, and revitalising socio-ecological production landscapes with an example of GC certification in Tainan City’s Guantian district. The initiative was spearheaded by the Foundation and the Forestry Bureau to develop a system that supports farmers in the adoption of sustainable practices. Farmers and rural agricultural communities benefited from environmental conservation and wildlife protection, which resulted in returning species at risk. By conducting agricultural training at district level and involving facilitators ease farmers into being receptive to new sustainable agricultural practices. Through these systems of training and certification, the initiative functioned as a catalyst in drawing producers to the GC standard and therefore motivated them to evaluate its importance positively for both policy and institutional support. By training farmers to implement sustainable agricultural practices, TOAF was able to effectively mobilize support in agricultural communities to manage and use biological resources sustainably thus maintaining and nurturing biodiveristy and ecosystem resilience so that the next generation can enjoy ecosystem services. The facilitators in the GC program, with support from the Forestry Bureau, have continuously engaged farmers in training sessions or activities to build their capacity in understanding the benefits of adopting sustainable practices. With ongoing use of these practices in an integrated approach, farmers have noticed the difference in the form of improved soil health; reduced pest pressure and regeneration of natural enemies to pests; and high-quality produce from their fields. This has attracted other farmers into the system to enjoy the benefits of these sustainable practices and the continued application of ecological practices has become a culture among many small-scale farmers in Taiwan with obvious benefits. Over the past seven years, Green Conservation certification has expanded dramatically. The Foundation’s work in the community has made an impact in terms of enhancing capacity building, knowledge facilitation, and understanding of sustainable agriculture. These impacts are manifest through the level of community commitment and participation which enable conditions for raising awarness about the importance of socio-ecological production landscapes throughout the communities.